Traders and missionaries were the first Europeans to venture into the Waikato in the 1850s. After Cambridge was established in July 1864 general stores were set up on both sides of the Waikato River to provide for the 1,000 young soldiers waiting for their land ballots. As farmers, these young men broke in their land and grew wheat and oats to sell to the Auckland market. 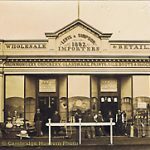 The general stores sold sugar, tea, fabric, seeds and saddles, and so the Cambridge business area grew. Duke Street was the busy place with two hotels and a church nearby. The selling and leasing of land through the Native Land Courts brought in cash to spend. In our Cambridge Museum archives are some interesting business accounts showing the basic items needed in those times. Here is a small history of those people who helped to make our business area the thriving town we have today. R T Tudehope – Draper, clothier, etc.